The members of The Cossitt Family Association owe their gratitude to Pearl Steele Cossitt, for he was our first archivist. Pearl was born March 30, 1817 in West Hartford, Connecticut. He was the great great grandson of Rene and Ruth Cossitt. At the age of 14, his father having died, he went south with his uncle, George G. Cossitt, and remained there until 1840. While in the south with his uncle, he learned the mercantile trade. At age 23 he returned to New England with some means and entered Trinity College, Hartford, Conn., from which he graduated in 1844. He studied law and then theology at the Princeton Theological Seminary and graduated in 1847 with an A.M. degree. About 1853 he gave up the active duties of a pastor and went west. In 1858, he removed to Indiana, where he resided during the Civil War, in which he took an active part. While in Indiana, he was, for a season, connected with the Terre Haute Female College. In 1865, he removed to Noble, Richland County, Illinois where he engaged in the mercantile business for some ten years with success. 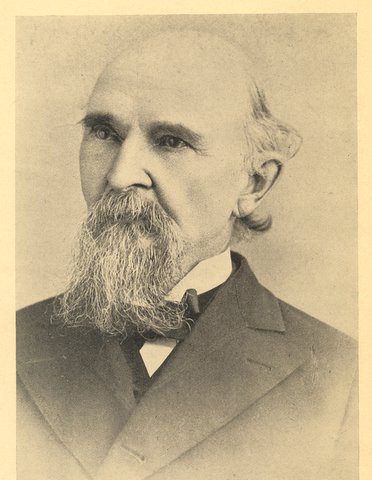 In 1875, he removed to LaGrange, Cook County, Illinois until his death Jan. 29, 1892. At age 32 he married Sarah B. Northrop of Hartford while he was a pastor there. While we do not have any records, it is presumed that Sarah died in or after 1841 when their first and only child was born. 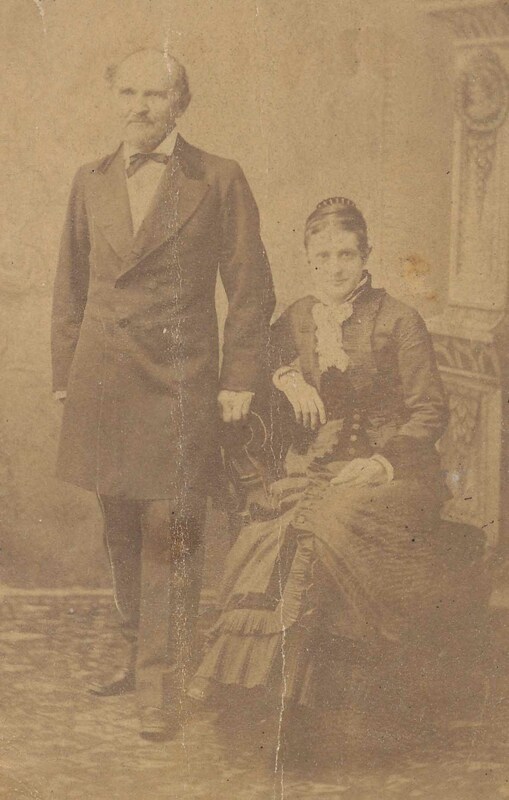 On August 14, 1856 at age 39, he married Eliza Squires of Manlius, N. Y., who died in an accident in 1878 at Western Springs, Illinois. At the age of 62, he married his third wife, Mary L. Johnson who was only 27 years old. Pearl and Mary had four children. Mary died in 1918 in Chicago. 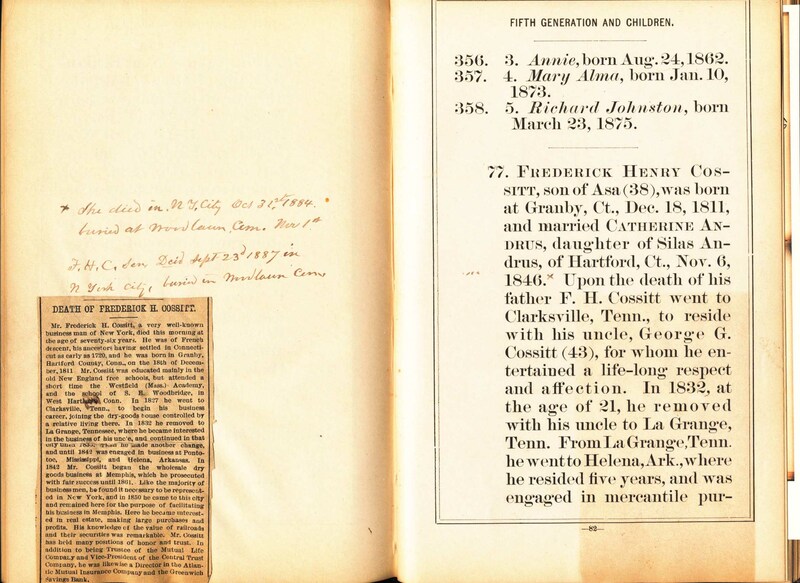 In 1879 at the age of 62 he published his compilation of all of the descendents of Rene and Ruth Cossitt under the title Cossitt Family: A Genealogical History of Rene Cossitt, a Frenchman Who Settled in Granby, Conn., 1717, and of his descendants to 1879. In the PREFACE to this book he states: "The gathering of much of the material for this work was performed by my brother, F. H. Cossitt and my sister, Mrs. Henry Talmadge (Frances Anna Cossitt), both of New York City, but with no intenetion of having it published. After bringing together, however, so much that would be interesting to the different members of the family, it seemed to be the only convenient way to preserve and transmit it." 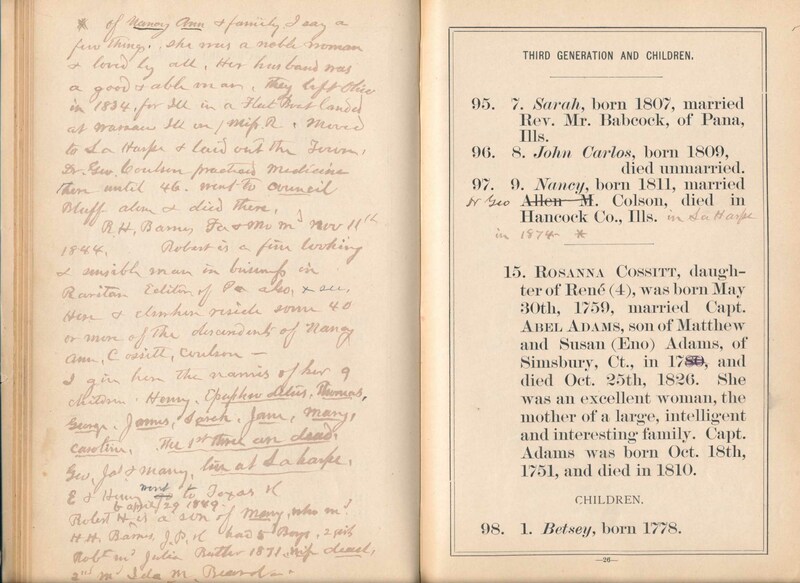 After this book was published, he continued to update his work as seen by his hand written notes in the margins on some of the pages of his 1879 book (see below). In 1925, his nephew, Frederic Henry White and his second cousin, once removed, Frederick Briggs Stebbins published their continuation of the compilation. While the 1879 book is quite rare, both it and the 1925 book are occasionally available on the internet. 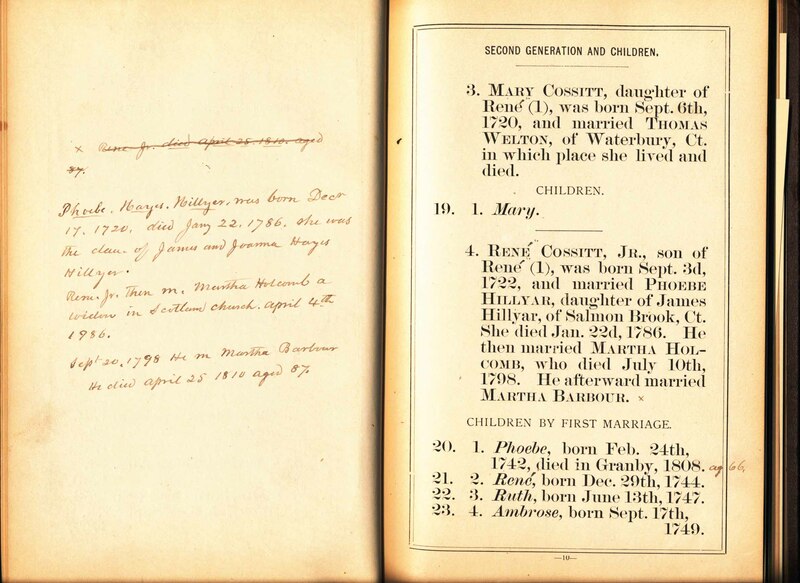 The 1879 book lists "445 heads of families by the end of the sixth generation". We must remember that in the 1870's there were no telephones, fast typewriters, computers, internet, DNA testing, nor reliable mail service. The task of accumulating all of this information was tremendous and tedious. Special thanks to Fred Shelton, the great grandson of Pearl Steele Cossitt and Mary L. Johnson for providing the information, pictures and copies of pages from the original book. Pearl and Frederick H. Cossitt were brothers.